Injury is a feature of all medical practice, but it is perhaps nowhere more accepted as an unavoidable consequence of therapy than in obstetric and neonatal medicine. Treatment is usually beneficial, but therapeutic procedures may sometimes result in adverse side effects or cause iatrogenic damage. Most side effects are minor problems, but some can be serious and may result in a major handicap, long-term sequelae, or death of the infant. 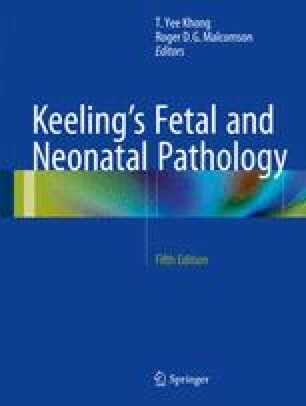 Invasive antenatal investigation and treatment and the increasingly complex interventions in neonatology have resulted in the appearance of new types and patterns of pathology. Recognition of side effects, especially with the advent of newly developed therapeutic strategies in the neonatal intensive care unit, is very important, and the clinician must be alert and carefully monitor these children. This is important to minimize side effects and serious damage. The pathologist is sometimes the first to recognize these adverse effects but should be very well informed about the therapeutic interventions and therapies that were performed before beginning an examination to be able to recognize these side effects.